1969 was the second version of the C3 third generation Corvette which addressed many of the short comings of the 1968 including removal of the "thumb buster" push button to open the doors. 1969 saw the return of the "Sting Ray" name tag but as one word "Stingray". Side mounted exhaust was now available. Fiber optics were added. The ignition switch was moved from dash to steering column. A 3-speed turbo hydra-matic transmission was first offered. The Coupe (T-top) out sells the convertible. See specs and production numbers below. Sting Ray name returns to Corvettes but as one word (Stingray). 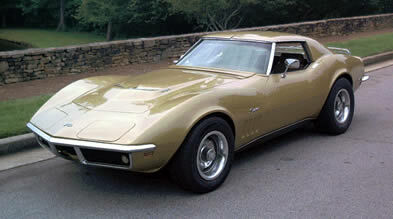 1969 Corvette Coupe outsells the convertible for the first time. Standard engine is now a 350 cubic inch but four 427s are available. The ignition switch is now mounted on the column versus the dash. Pushbutton door openers ("thumb busters" from 1968) are dropped. A very nice Red Conv, manual with AC! 1969 Coupe - Asking price: $48990 - Factory Big Block with A/C!